New Delhi, 20 June, 2017: Prime Minister Narendra Modi met with Finance Minister Arun Jaitley and Finance Secretary Ashok Lavasa on monday evening to discuss his views on Pay Commission allowances, reported ANI. Jaitley is expected to present the proposals regarding the said allowances before the Union Cabinet for approval sometime soon. He, however, will be out of the country on an official visit to Russia. Jaitley, who is also looking after the Defence portfolio, will leave for a four-day visit to Russia on June 20. During his trip he will meet the Russian Defence Minister Sergey Shoygu to discuss matters of technical cooperation in the field of defence. He is expected to return by June 24. This means Jaitley will not be present for the Cabinet meeting scheduled on Wednesday (June 21) later this week. He is responsible for tabling proposals pertaining to allowance reforms mandated by the Seventh Pay Commission, and modified later by the Committee on Allowances and Empowered Committee of Secretaries (E-CoS). The federal Cabinet too is reluctant to discuss the matter in absence of its Finance Minister as seen in the past two weeks. Twice the issue of reformed allowance structure has been dropped from the Cabinet's agenda. First time it was when Prime Minister Narendra Modi was away on his four-nation foreign visit during the first week of June. Central government employees were disappointed once again last week when Finance Minister was away in South Korea. The matter of central government employees' allowances has been pending for almost one year now and the hiccups seem to stick even towards the end. The Pay Commission had recommended that out of a total 196 allowances, 52 be discontinued entirely whereas 36 other allowances should be subsumed under other allowances. Apart from this, the pay panel called for cutting down the House Rent Allowance (HRA) which constituted the bulk of an employee's paycheck. The Pay Commission suggested HRA to be brought down to 24 per cent, 16 per cent and 8 per cent of the basic pay, to be paid according to the city the employee is positioned in. The preceding Pay Commission had pegged the same at 30 per cent, 20 per cent and 10 per cent. The Cabinet formed the Committee on Allowances under Finance Secretary Ashok Lavasa in June last year after the central government employees expressed their dissatisfaction against them. The motive of this Committee was to look into the extensive changes suggested by the 7th Pay Commission. The Lavasa Committee handed over its review report to Jaitley in April after consulting representations from various government departments and agencies. After approved by the Department of Expenditure, this report was forwarded to E-CoS for their consideration and consolidation. The Empowered Committee submitted the report once again to the Finance Minister on June 1. Reports state that the E-CoS has capped HRA rates between 25 per cent and 27 per cent. The Cabinet may, however, approve rates higher than that to compensate for the delay in paying allowances as per new rates according to the 7th Pay Commission. The final move now is for Cabinet to approve the recommendations about the allowance structure, has been awaited for two weeks now. 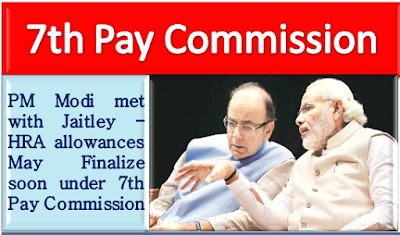 7th Pay Commission: PM Modi met with Jaitley - HRA allowances May Finalize soon, Discussed to review allowances under Pay Commission Modi met with Finance Minister Arun Jaitley and Finance Secretary Ashok Lavasa on monday evening to discuss his views on Pay Commission allowances, reported ANI. Jaitley is expected to present the proposals regarding the said allowances before the Union Cabinet for approval sometime soon.